Purchase.ie is offering you the chance to save on over 200 products for the month of September. With energy rates increasing on October 1st 2012 this is a great opportunity for you to save money on our large range of energy saving products. These products will help you to counter the ever increasing energy rates and help you save money in the long run. To avail of a 10% discount on all our products all you have to do is submit the promotion code Sept10 at checkout when placing an online order. Alternatively call us on 01 8428187 and quote the code and we will process the order for you over the phone. 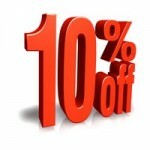 Please note this promotion is only valid until September 30th 2012. Next Next post: Get some free Stuff!